While the embassy is being cleared out for good, Carrie and Quinn have different agendas. Surprisingly, both get the chance to take out Haqqani, but don't. Quinn's attempt is blighted by Carrie, who is within spitting distance of the target. When Carrie aims at the terrorist, she makes a shocking observation. The title "Krieg Nicht Lieb" is missing an "e" - "Krieg, nicht Liebe" would be "War, not Love"
This hit all the right spots. Well done, Homeland. I'm very interested in Quinn's history with the German woman. She seems to know a lot about him. Oh Dar Adal, what are you up to now? Wow. Amazingly suspenseful episode. Though Carrie is incredibly irritating in preventing other people from going rogue the way she unhesitatingly does. They are going to have to wandwave this extremely hard to get me to buy Dar Adal's justification for what he's doing. What could possibly be the upside? Though Carrie is incredibly irritating in preventing other people from going rogue the way she unhesitatingly does. My husband had the same complaint when we were watching, but Quinn was willing to blow up a crowd of innocent people. Carrie would have only killed Haqqani and she probably would not have made it out alive but that would have been worth it to her. Not saying this is her train of thought (she's much more off the cuff) but I didn't have a problem with this particular instance. Fun fact: Quinn's (ex) lover (Nina Hoss) was not the only German actor, Haqqani is portrayed by German Numan Acar. I had a bizarre moment when seeing Nina Hoss in this episode because I had watched the Le Carré adaptation A most wanted man a couple of days earlier, where she plays a German spy. Robin Wright plays a somehow saner and more ruthless version of Carrie Mathison in that film, which was amusing. 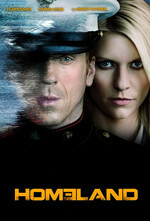 This season of Homeland owes a lot to Le Carré I think. I dunno about this episode. I wanted to like it, but... Quinn as Murder Death Robot satisfies again, he really is the most interesting character on the show. And I love he has a woman in this port, one who can break cell phones and arrange a key or two of C4 on short notice. But just so much drama for naught, the whole bomb plot, then Carrie with the pistol, and on top of that her father dying. And then on top of on top of that Dar Adal showing up? Like Justinian says, they're going to have to stretch to make that make sense. If it turns out Haqqani has been a friendly asset all along I may throw things at my TV.